You are here: Home / appetizer / Cheese Board – Make the Perfect Cheese Board! Cheese Board – Make the Perfect Cheese Board! 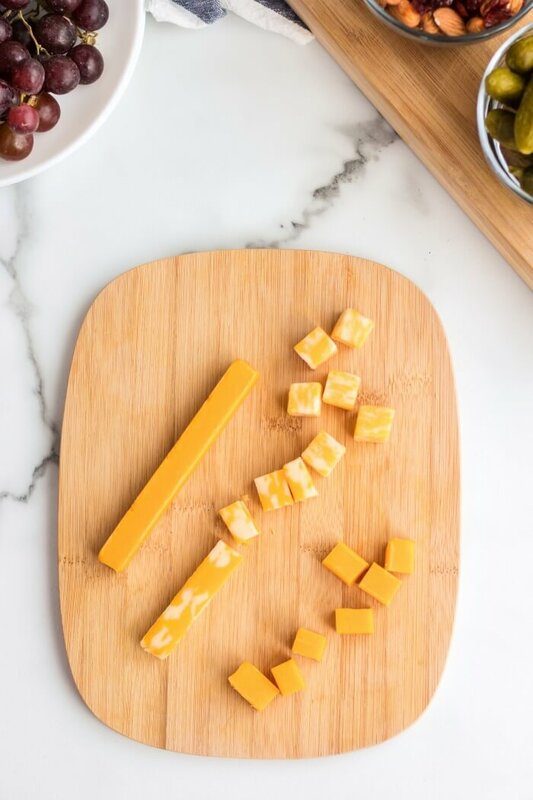 A Cheese Board is one of our favorite quick and easy afternoon snacks or fun dinners. Put all your favorites together to make the best cheese board! This Cheese Board Recipe is sponsored by The Hillshire Brands Company. All comments and opinions are my own. 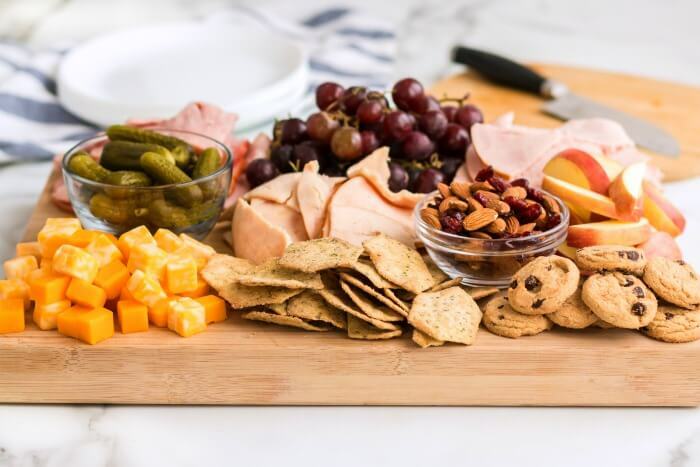 A Cheese Board, also sometimes called a Charcuterie Board or Meat and Cheese Board is a wonderful way to serve a meal or appetizer that will please everyone. We even use them as a fun way to finish up leftovers! 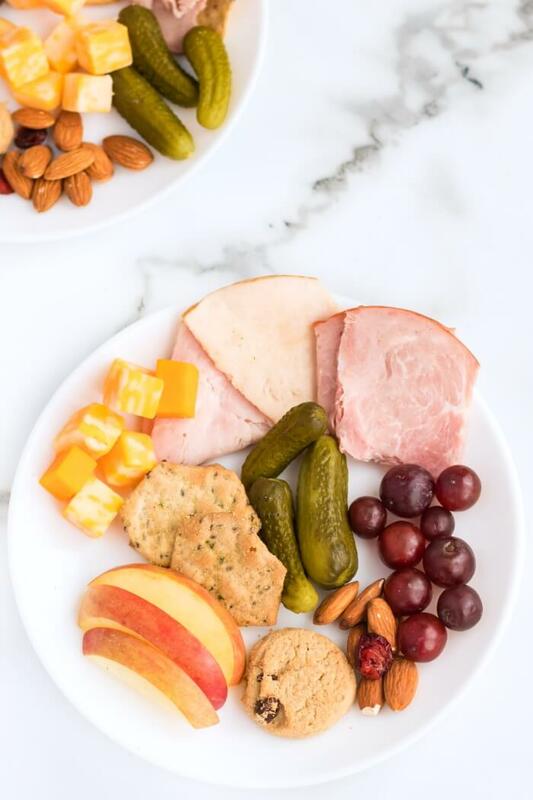 Scroll through to see all our tips for putting together the best cheese board ever and then make sure you add our refrigerator pickles, and olive tapenade to your next cheese board adventure! Cheese – Pick your favorite cheeses! They can be anything from high-quality, specialty cheeses like brie and Roquefort, or they could be cut up string cheese and strips of American cheese slices! Meat – We are partial to lunch meats and cured meats (the Hillshire Farm® Premium Carved Meats). Choose your favorite meats and feel free to throw in some leftovers like some of that baked chicken you have in the freezer. Crackers or Bread – Again – if all you have is sandwich bread, that’s no problem! Cut it into bite sized pieces and toast it! Or, go crazy and bake mini dinner rolls or beer bread. Pretzels count too! 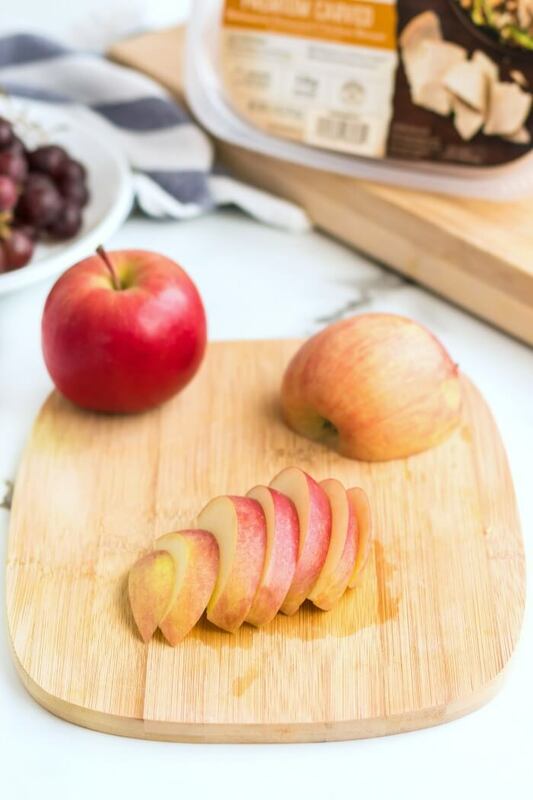 Fruits – I love grapes and apples because they’re easy and always on hand, but nearly any is beautiful on a cheese board and adds a nice touch of sweetness. Veggies – This could be fresh carrots and cucumber slices or roasted red peppers and pickles from a jar. Or both! Sweets – Some folks use fruit for this category, but I like to add a touch of dessert to my cheese boards. Maybe a small dish of chocolate chips, or some small cookies. Dips or Spreads – I tend to skip this when I’m making a cheese board for the kids, but if it’s for kids and adults, you’d better believe I’m adding jams, jellies, olive tapenade, cream cheese dip, and all the amazing things I can pull out of the fridge! How Do You Make a Cheese Board? First, choose a board that you’re going to put everything on. It doesn’t have to be fancy! We often will use a large sheet pan. Next, gather your ingredients. We try to always include meats, cheeses, fruits, and breads. Then, make sure everything is bite size and easy to eat without utensils. Cut larger items up into smaller pieces. Finally, arrange everything on your board. Remember to put the wet items in small bowls or jars to avoid dripping and muddling flavors. Is a Cheese Board the Same as a Charcuterie Board? 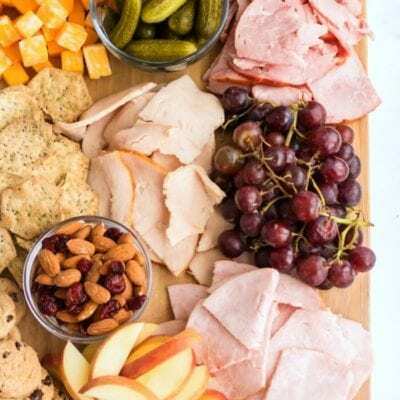 A cheese board is not the same as a charcurterie board insofar as historically a cheese board is centered around a selection of cheeses and a charcuterie board is centered around a selection of meats. That said, these days the terms cheese board and charcuterie board are typically used interchangeably to mean a meat and cheese board with a variety of meats, cheeses, fruits, nuts, and breads. 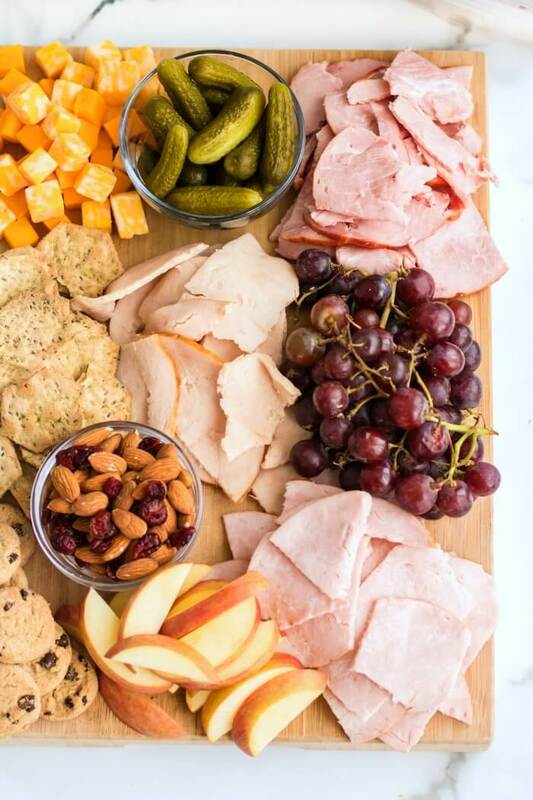 We used Hillshire Farm Premium Carved Meats on this delicious cheese board! They are truly like buying from a butcher or carving from a baked rotisserie item, which makes it possible for anyone to build better meals with premium meats! 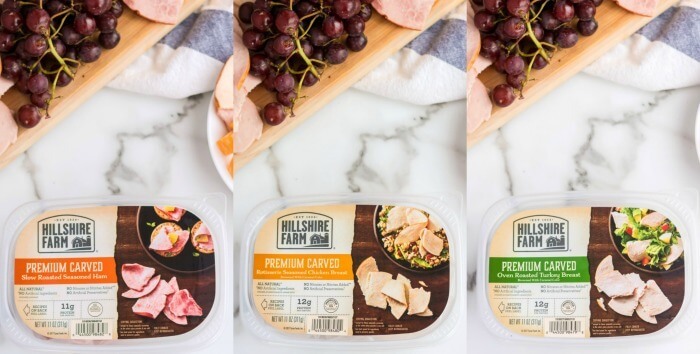 You can find Hillshire Farm Premium Carved Meats located with the packaged lunch meat in perimeter coolers at Walmart. Or make it easy on yourself and use the Walmart Online Grocery Pickup! What to Put My Cheese Board On? A cheese board can be assembled on almost anything! 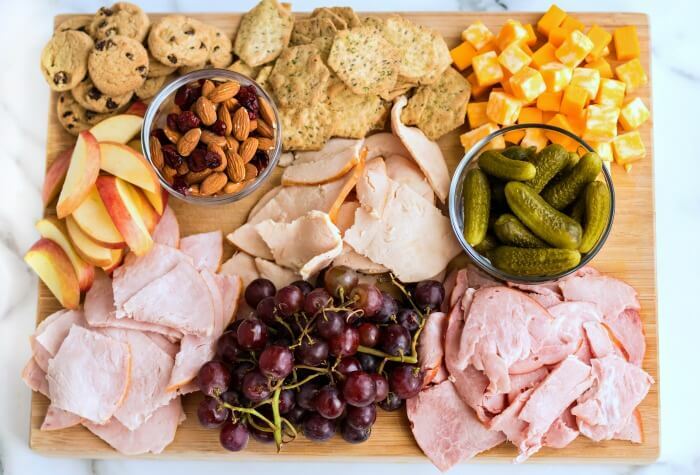 Don’t let not having the “right” platter stop you from making an awesome charcuterie board. Here are some things we’ve used in the past to make our meat and cheese boards! Cutting Board – This is a pretty standard way to serve a cheese board. Choose a large one for a crowd or a smaller one for a more intimate board. Slate or Chalkboard – We once served a massive breakfast cheese board with the cutest mini greek yogurt pancakes on our huge homeschooling chalkboard. It was amazing! Just make sure it’s very thoroughly cleaned, and if you’re still worried, just toss some parchment paper under the food. Pizza Pan – A pizza pan is the perfect size for a family cheeseboard – and it’s such a fun shape. Put it on a lazy susan for easy self serving! Baking Sheet – We prepare the majority of our cheese boards on a baking sheet. It’s just the right size for a family of seven, and I love that the lip around the edge keeps things from rolling off. Dinner Plate – Making a romantic cheese board for two? Try a large dinner plate piled high with your favorite goodies. 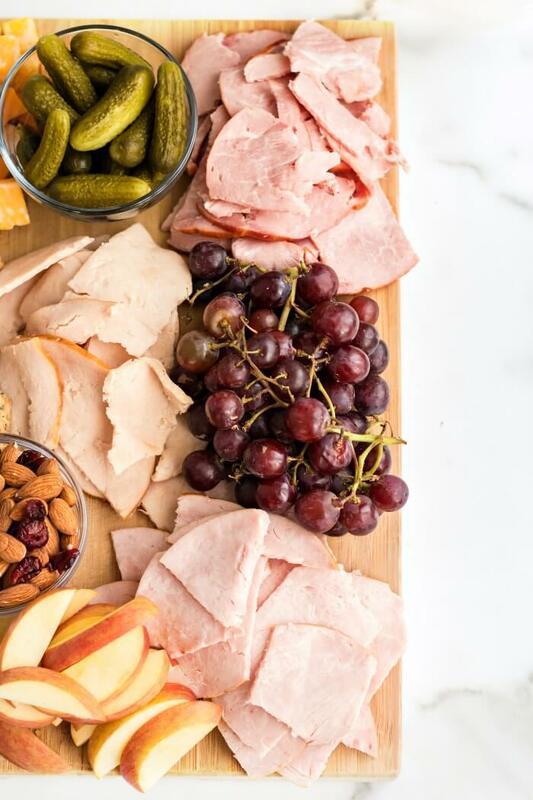 Charcuterie boards are easy to make and these tips and tricks will ensure that you have the perfect meat and cheese board every time! Use small bowls to keep wet or moist ingredients from running into the other flavors. Don’t have tiny bowls? No big – just make some out of foil! This may be a little bit controversial, I know some folks love their garnish. But on a colorful variety-filled cheese board, there is absolutely no need for garnish. And really, who wants to accidentally get a mouthful of parsley or rosemary with their pickle? What is a Cheese Board? A cheese board is a tray filled with a variety of cheeses, meats, fruits, vegetables, breads, and nuts. Beautiful cheese boards are often served at parties to entertain guests. But they also work great as snacks and quick dinners. 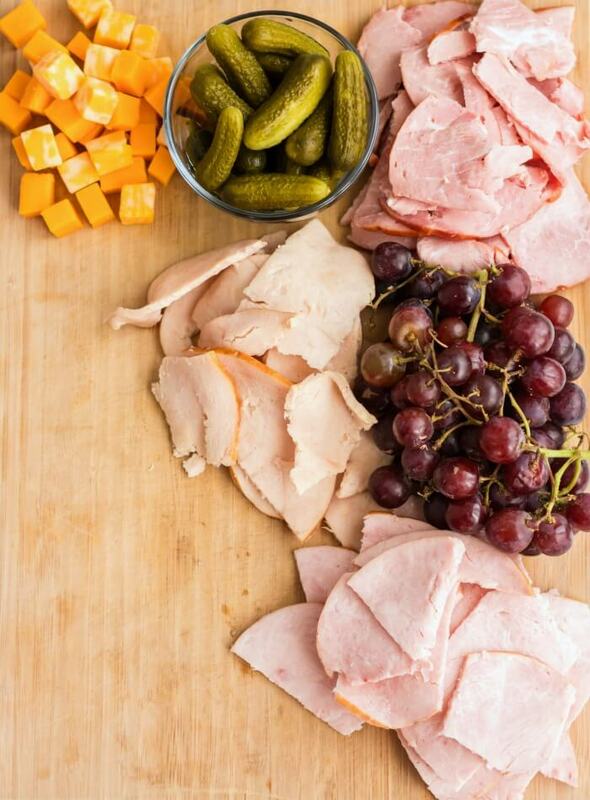 What is on a Charcuterie Board? A charcuterie board is essentially the same as a cheese board, but focuses more on the meats. You will often find a variety of cured meats, fragrant cheeses, fruits, vegetables, breads, and nuts. Can I Make a Cheese Board Ahead of Time? You can make a cheese board ahead of time – I like to have all my ingredients prepared ahead in separate containers and then place them on the board immediately before serving. This keeps the flavor from mixing and prevents your crispy bits from getting soggy. 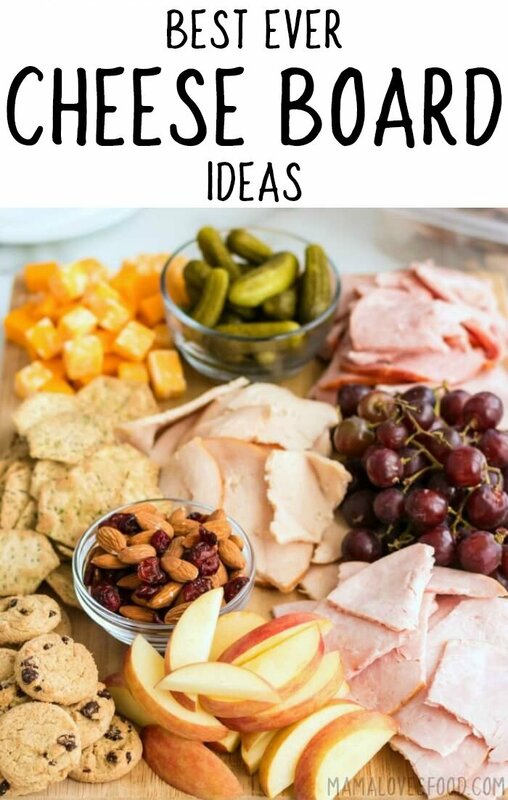 Here are some fun themes for your next charcuterie board! Breakfast Cheese Board – Try including some mini pancakes, cut up waffle bits, and bite sized sausages for a fun breakfast themed board. 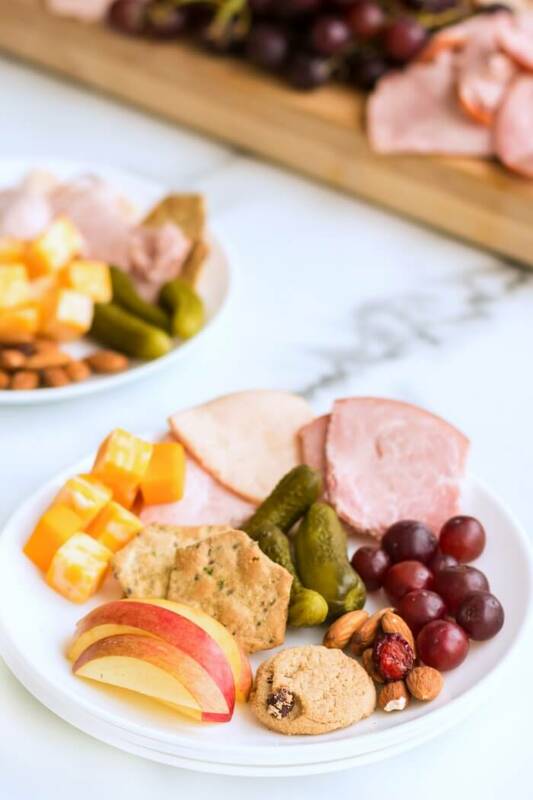 Snack Cheese Board – We love doing after school snack boards with lunch meat, pickles, carrots, string cheese, and cottage cheese. Game Day Cheese Board – One of my favorite boards to make! Lunch meat, hoagie bread, wings, and pizza slices are perfect for a game day board. Romantic Cheese Board – Chocolate, strawberries, fondue, and maybe some steamed mussels or oysters. Dessert Cheese Board – Think cheesecake bites, fudge, cookies, ganache, and mini cupcakes! 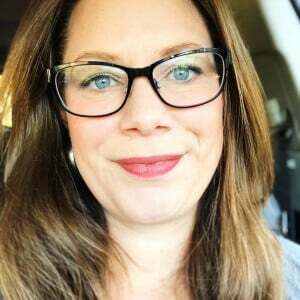 When Should I Make a Cheese Board? There is no bad time for a cheese board! But here are some ideas in case you need some inspiration! In addition to meats and cheeses, here are a few of our recipes that I like to include on the board whenever possible. A cheese board can be a full meal on its own, an appetizer, or a snack! We love to serve a pot of soup alongside our charcuterie boards, or a fun punch if we’re having a party. Here are some recipe ideas! 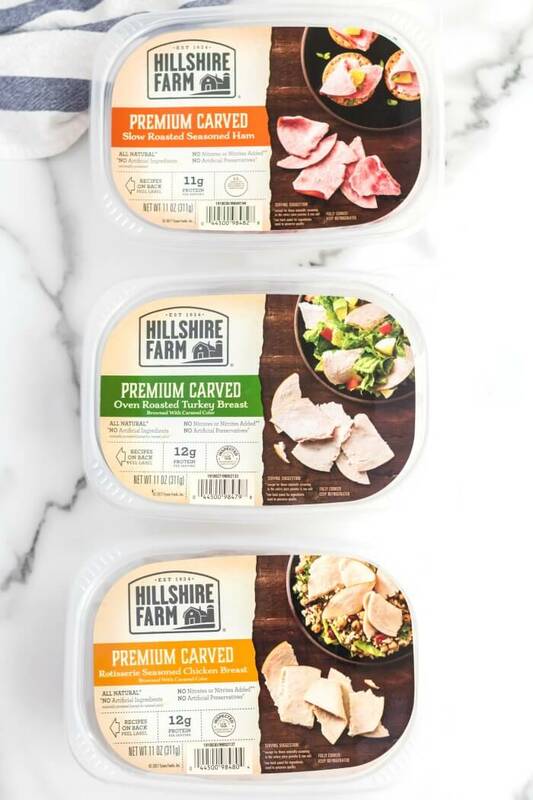 I love Hillshire Farm Premium Carved Meats because I get the same quality and flavor as I do with deli meats, without having to stand in line for 30 minutes. These deli meats are premium carved cuts of high-quality meats that are perfect for any occasion. And I don’t worry about feeding them to my family because they are all natural, contain no artificial ingredients, have no nitrates or nitrites added, and contain no artificial preservatives! 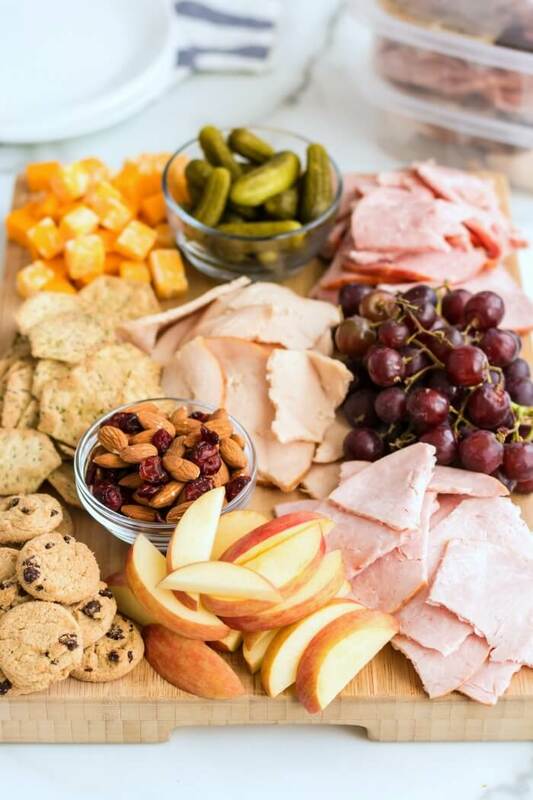 You can purchase Hillshire Farm Premium Carved Meats at Walmart to use for your next cheese board, or any occasion! Santuko knife – My favorite knife for cutting vegetables! This knife is the perfect size and shape, handles great, and is super reasonably priced. Also, I just love that it’s fun and colorful! End grain cutting board – This is my absolute favorite cutting board and the one that I get the most compliments on. And p.s. I have a lot of cutting boards. It really is absolutely stunning, and knows how to take a beating. We use it every single day! First, choose a board that you're going to put everything on. It doesn't have to be fancy! We often will use a large sheet pan. 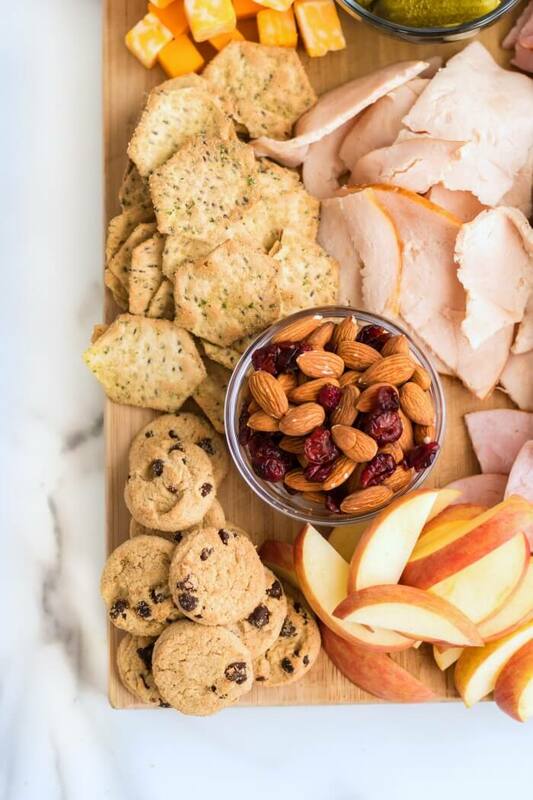 We used Hillshire Farm Premium Carved Slow Roasted Seasoned Ham, Hillshire Farm Premium Carved Oven Roasted Turkey Breast, and Hillshire Farm Premium Carved Rotisserie Seasoned Chicken Breast on the pictured board. Calories are automatically generated. For best results calculate based on your exact ingredients. Those were such great tips on making a quick cheese board at home. This is a super helpful, one-stop guide for everything cheese board! I’ve tried this a few times, but always felt my cheese boards were missing something. I’ll be sure to save this for future reference. Thank you so much for sharing!